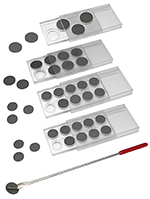 High quality magnetic stainless steel (alloy 430) discs for Atomic Force Microscopy are offered, with smooth edges and consistently flat surfaces. The AFM/STM disks are 20 gauge which is 0.0359" (0.91mm) with a range of 0.0329" to 0.0389" (0.835mm to 0.988mm) thickness. Available in 6, 10, 12, 15 and 20mm diameter, supplied in packs of 50 in a clear tube which will fit into the PELCO® AFM/STM Diskpenser (see below). PELCO® Gold Coated AFM/STM Discs provide excellent substrates for mounting specimens due to their excellent resistance to electromigration, high electrical and thermal conductivity and high temperature operation properties. Gold is the most inert metal. Its adhesion to polymers is expected to be lower than that of other metals, however polymer irradiation with UV light and plasma discharge have been reported to enhance metal-polymer adhesion. High quality gold coated magnetic stainless steel (alloy 430) discs for Atomic Force Microscopy are offered with smooth edges and consistently flat surfaces. The AFM/STM discs are 22 gauge which is 0.0299" (0.76mm) with a range of 0.0269" to 0.0329" (0.68 to 0.84mm) thickness, coated on all sides with 0.25 microns of gold. 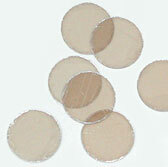 The discs are supplied in PELCO® AFM/STM Disc Carriers. They are available in 10, 12, 15 and 20mm diameter. 12mm, thickness #1 (.13 to .17mm) approx. 173 per 1/4 oz. 15mm, thickness #1 (.13 to .17mm) approx. 111 per 1/4 oz. Highest quality grade V1 mica, 0.21mm (0.0085”) thick. Interleaved, in packages of 10. Can be mounted on AFM/STM discs. A practical way to store and dispense AFM/STM discs. 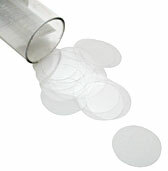 The plastic tubes in which the discs are packaged may be inserted into the PELCO® Diskpenser. With a turn of the cylinder one disc is dispensed, ready to be picked up with the PELCO® Disc Gripper as shown below. The PELCO® Diskpenser will dispense either 10, 12 or 15mm Discs. 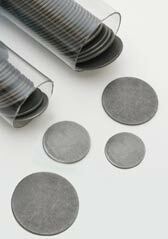 An inexpensive way to store 10, 12, 15 and 20mm AFM/STM discs in a dust-free environment. Discs are placed face down into a stepped cavity where the specimen is protected. The cavity allows for a maximum specimen height of 3.2mm (1/8"). The AFM/STM discs are retrieved by using the convenient PELCO® AFM Disc Pickup Tool, comprised of a plastic handle, stainless steel shaft and a magnetic pad on the tip. Fingers need not touch the disc. The PELCO® AFM/STM Disk Storage Boxes have a single pole magnetic in the base of the box to store stainless AFM discs with 6, 10, 12, 15 or 20mm diameter. Designed to sort and organize AFM/STM samples and protect them from dust. These storage boxes are ideal for storing and transferring AFM/STM samples in the lab. 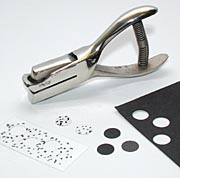 A marker pen can be used to write on the magnetic material to mark the sample positions. 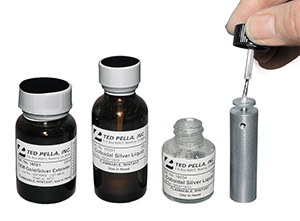 Samples can be lifted from the storage boxes using PELCO® AFM Disk Grippers (shown below). Not ideal for shipping AFM samples. The PELCO® Disk Carriers are better suited for shipping AFM disks. Single storage box holds one AFM disc of either 6, 10, 12, 15 or 20mm diameter. Inside measurements of the clear styrene box are 25.4 x 25.4 x 15.9mm (1" x 1" x 5/8"). Sold in packages of 5. Small storage box holds up to 4 discs depending on size of the AFM discs. Inside measurements of the styrene box are 70 x 28 x 18mm (2-3/4" x 1-1/8" x 11/16"). Box has a clear lid and a blue base. Large storage box holds up to 20 AFM discs depending on size of the AFM disks. Inside measurements of the styrene box are 152 x 51 x 18mm (6" x 2" x 11/16"). Box has a clear lid and a black base. 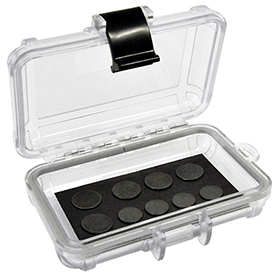 Very strong and rugged clear polycarbonate box to store stainless steel AFM discs with 6, 10, 12, 15 or 20mm diameter. The PELCO® X-TREME storage box is watertight, crushproof and dustproof. The strong hinges, locking clasps and O-ring seal makes this box suitable for transport, shipping and storage of the stainless steel AFM discs. Ideal for storing calibration and test samples. The box has a single pole magnetic layer in the base with a size of 47 x 86mm (1.85" x 3.4"). 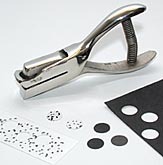 A marker pen can be used to write on the magnetic material. Outside dimensions 112 x 77 x 36mm (4.4" x 3" x 1.4"), maximum specimen height is 21mm (0.81"). Turned from solid aluminum, this workstation features an adjustable internal magnet to securely hold a metal AFM/STM Specimen Disc in place. 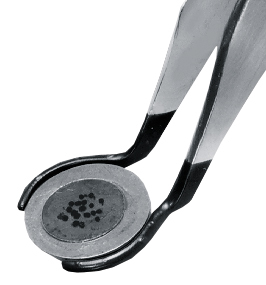 A tray around the circumference of the central disc holder may be used to catch residue or hold additional discs. Specially designed rubber coated tips for picking up AFM/STM discs from a flat surface. Transfer Atomic Force Microscopy Discs from Diskpenser to PELCO® AFM Workstation to Microscope and to PELCO® AFM Disc Carrier or AFM Disc Storage Box with ease. The Cross Section AFM/STM Mounts and AFM/STM Sample Holders offer a convenient way to clamp and position cross sectional samples for AFM imaging. The holders are all made from high quality magnetic stainless steel (alloy 430) so they can be easily attached to the magnetic sample holder of the AFM system. The small 12mm diameter, 4.5mm height and 3.5mm feature depth will make the cross section holders compatible with most AFM systems on the market. 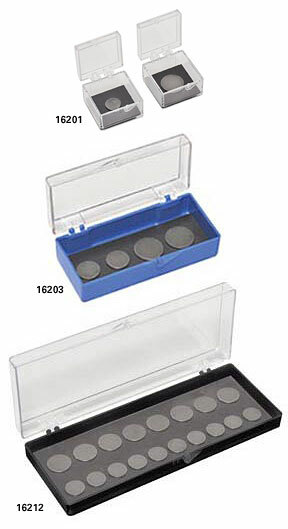 Packaging: The PELCO® Silicon Aperture Frames are packaged under cleanroom conditions in the PELCO® #160 TEM Grid Storage box. Each box holds 10 discs. Si-chips are opaque, of low electrical resistance and have surface properties equal to glass (including smoothness). 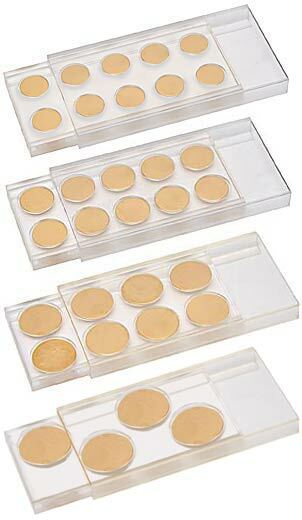 They are also good substrates for growing or mounting cells. Si-chips are precleaned before packaging. Also ideal for imaging small particles due to low background signal. Availability: 4" wafer (#16010) is precut into 5 x 7mmm, 5 x 5mm, 10 x 10mm, 20 x 20 mm or 20 x 30mm chips that can be easily separated in the laboratory. Peters, K.R., 1985. Working at higher magnifications in scanning electron microscopy with secondary and backscattered electrons on metal coated biological specimens and imaging macromolecular cell membrane structures. Scanning Electron Microscopy, IV:159. Apkarian, R.P., High-resolution signal detection of specimen-specific secondary electrons in an analytical SEM, "Proc.. 44th Ann. Meeting of the EMSA", 1986, G.W. Bailey, Ed., San Francisco Press, 658 . 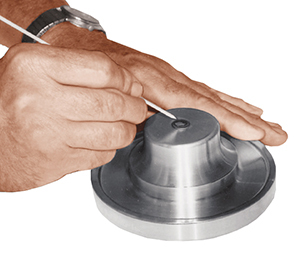 SEM: For placing adhesive tapes or sheet material on specimen mounts, punch a conveniently sized circle, prior to mounting. TEM: Punch circles from ACLAR® film for growing cells on a rod-type holder end for ultramicrotomy. Thinner, 2mil ACLAR® now available for easier punching. Easily grasp AFM/STM cantilevers / probes with these precise, non-magnetic stainless steel AFM Probe Tweezers. 4-5/8" (117mm) long. Although these tweezers are made from non-magnetic stainless steel, magnetization can occur in the presence of strong magnetic fields. Precision formed, Swiss made, low carbon, non-magnetic, austenitic steel (material number 1.4435, DIN X2CrNiMo 18-14-3, AISI number 316L) for precise manipulation of cantilevers and probes. 4-3/4" (120mm). Non-magnetizable. Easily grasp magnetic AFM/STM cantilevers / probes with these precise titanium, absolutely non-magnetic tweezers. 4-5/8" (117mm) long. High quality glass, standard microscope slides coated with 50nm of gold with a 5nm chromium adhesion layer between the glass slide surface and the gold coating. Can be used for a wide range of nanotechnology, biotechnology and AFM applications. Also suitable as an opaque microscopy support. Both Cr and Au are evaporated on the glass slide using a vacuum evaporation system. The gold surface is not atomically flat, but has bumps in the nm range. The gold slides are individually packed in a slide mailer. The gold slides are autoclavable. High quality, borosilicate glass coverslips coated with 50nm of gold with a 5nm chromium adhesion layer between the coverslip surface and the gold coating. Can be used for a wide range of nanotechnology, biotechnology and AFM application. Both Cr and Au are evaporated on the glass coverslips using a vacuum evaporation system. The gold surface is not atomically flat, but has bumps in the nm range. The coverslips are sold in packs of 2 and are packed in an X0 Gel-Pak box. The gold coated coverslips are autoclavable.